Run by owner, Renee Droese who started this business 15 years ago. Renee's soaps are made using the traditional cold process method from scratch, using natural vegetable oils, natural colorants and either pure essential oils or phthalate free fragrance oils, using no preservatives. Renee started this business 15 years ago. Renee's soaps are made using the traditional cold process method from scratch, using natural vegetable oils, natural colorants and either pure essential oils or phthalate free fragrance oils, using no preservatives. Renee's soaps are long lasting, provide a rich lather and smell heavenly. She makes oatmeal soaps and goats milk soap using fresh goats milk from my neighbors goats. 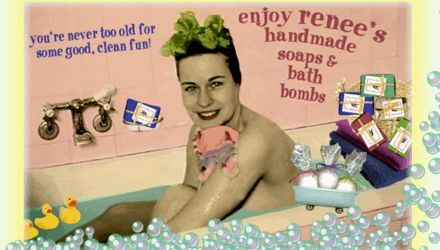 Renee also has a line of fizzing bath bombs in over a dozen different fragrances, lip balms, and a new line of lotions that are over 90 percent organic using Shea butter, cocobutter and jojoba oil. Soap prices are the same as they were when the company was started 15 years ago.